SRS is the accepted abbreviation for â€œspaced repetition systemâ€ a useful system for learners of languages like Japanese. There are many different kinds of SRS for Japanese learners, the most popular seems to be Anki and one of my past favourites was iKnow. 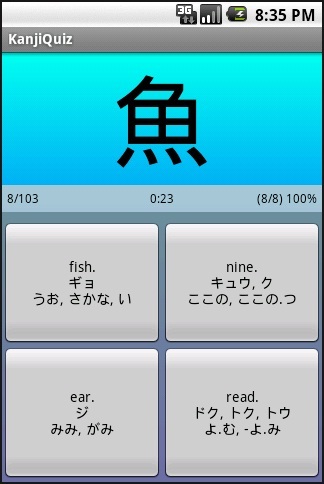 There SRS I mostly use these days ins called KanjiQuiz and it is an app for my android phone. I like KanjiQuiz because it is for beginers, simple, lightweight and to the point, at less than that 150kb it’s perfect for my aging memory-shy HTC Legend. Speaking of aging phones, just in case anyone reading this is wondering what to get me for my Birthday in a couple weeks (March 8th) please send me a Samsung Galaxy Nexus! With KanjiQuiz you can select all or a sampling of the Kanji from the lowest JLPT test and quiz yourself from time to time. Perfect those times when you have a few minutes downtime such as while on the train, waiting or in a line of some sort. Some people can seriously use it as part of there Japanese learning toolkit as it does a good job of helping users to learn and remember basic kanji. Check it KanjiQuiz today on the android market.